Now that you have your pair (or more!) of chinchillas, mating and pregnancy are not far behind. The female goes into heat about every 30 days for a period of up to a week. Chinchillas appear to mate the most during the cooler fall and spring months, and much more seldom in the summer. Just because two animals are bonded does not mean that they will breed. Many have had the experience of not getting any kits with a pairing, but when they switched them to other partners, voila! Some pairings are just less productive than others. Large chinchillas also tend to be slow breeders. Chinchilla pregnancy is much more consistent than that of humans! 111 days after mating (almost always) you will have a litter. Except in an emergency, you will not need to do ANYTHING! The mother will take care of everything. Once the baby is born she will clean it off a bit (obviously, they're quite wet) and sit on them to keep them warm and nurse. Make sure you have the number of an exotic pet veterinarian handy should any difficulties arise. If the baby is ignored for some reason you'll need to step in right away to warm and feed the kit. I often first realize we have a new kit when the chinchilla is sitting unnaturallly still! Kits will be delivered up to half an hour apart (the average chinchilla litter is two). The afterbirth will be delivered after each kit - you can pull it out of the cage if you can (otherwise the mother will eat it - although I haven't seen any problems emerge from this). If the male still has access to the female they will mate again within 2-3 days. You might want to give your chinchilla a break from pregnancy, although most large breeders encourage the "breedback", or consecutive pregancies. If you are going to allow the breedback provide a glass water bottle or small box for the kits to hide while the adults are busy. Otherwise, the kits might get trampled. 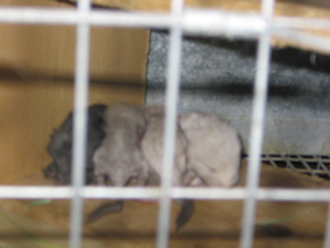 Check out the baby chinchilla page for more information on development. If you are using breeding runs, you will be able to control the mating and pregnancy much more closely. The pairing is easier (just block off the male for a week or so, then open up the cage) and you can restrict access after the mother gives birth.